All of the matches will start and finish on Aug. 20 in Rio de Janeiro. Check your local TV listings. At the end of that day, Lambdin will be in a position to appraise his accomplishments in the 22 years since his parents gave into his “harassment” and enrolled him in classes. There was a taekwondo center across the street from the restaurant where he blew out candles on his sixth birthday. » Now 6-foot-2 and 245 pounds, Lambdin was a shorter-than-average child and “chubby.” He got picked on back then in Colleyville, Texas, a suburb on the Fort Worth side of DFW airport. “I pretty thoroughly identified with people who would be capable of protecting themselves and protecting others.” At first, that meant Power Rangers and Teenage Mutant Ninja Turtles. » “As I got older, I’d say my taste in heroes became a little more realistic.” He loves LeBron James and Peyton Manning because of their dominance on the court and field, but also because they have big hearts and give freely to charity. » His parents both come from humble backgrounds and used to struggle financially. Once when he needed to get to a taekwondo tournament, they both sold their wedding rings to pay for the trip. » Seeking a boost in mental fitness, he traveled to Poland last year to attend a training camp with “the Iceman” Wim Hof, a Dutchman who is famous for feats like record-long baths in ice water. Lambdin jumped from a waterfall into frigid water and climbed 5,200-foot Mount Snezka in the wind and cold of December, wearing only shorts. » His favorite college professor is Helen Lim of the Criminal Justice Department. “She just always really encouraged us to try to see the situation or concept from all angles.” He says that helped him navigate the “super-political” process of Olympic team selection, in which the national squad of eight men gets winnowed down to two. 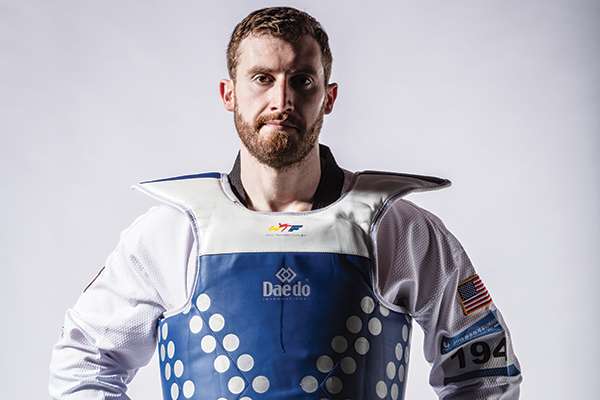 Lambdin won five collegiate national championships in taekwondo, a record, and represented Cal Lutheran for two of them. He won silver at the Pan American Games in Mexico in June. He trains in Edmond, Oklahoma, with USA Taekwondo coach Jason Poos.